Vance Williams is an Associate Professor in the Chemistry Department at Simon Fraser University in British Columbia, Canada. Vance’s first encounter with liquid crystals came in 1992 when he joined the research group of Robert Lemieux at Queen’s University. His Ph.D. research on induced cholesteric phases sparked his continuing fascination with the optical microscopy of liquid crystals. His current research is aimed at elucidating the relationship between a molecule’s structure and its tendency to self-assemble into columnar LC phases. His group’s investigations primarily focus on dibenzophenazines, which constitute a versatile class of discotic mesogens that tolerate a wide range structural variation and exhibit columnar phases over broad temperature ranges. • E. Voisin, E. J. Foster, M. Rakotomalala, V. E. Williams, Chem. Mater. (2009), 21, 3251. • C. Lavigueur, E. J. Foster, V. E. Williams, J. Am. Chem. Soc. (2008) 130, 11791. • E. J. Foster, R. B. Jones, C. Lavigueur, V. E. Williams, J. Am. Chem. Soc. (2006) 128, 8569. 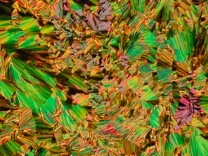 The photomicrograph shows a dibenzophenazine derivative prepared by Kevin Bozek in the Williams research group. The texture was obtained by slowly cooling the sample from the isotropic phase into its Colh phase. The sample was then mechanically sheared at 10°C below its clearing temperature (~210°C) to create the “fractured” appearance evident in this photograph. The sample was viewed with a 10x objective using an Olympus BX50 polarizing optical microscope equipped with a Linkam LT5350 heating stage and photographed using a Nikon 990 Coolpix digital camera. Jury comment: This is a colourful crisp picture that can inspire us as we go into winter.